How do you galvanise 3 million people to take meaningful action? By working closely with Amnesty, we were able to decipher their multifaceted international infrastructure and help them gain immediate value from the new global website. Amnesty International’s digital presence is complex - while countries like the UK had their own dedicated site, others such as Zimbabwe did not - so we first needed to determine a role for the global website, and then establish an aligned voice that audiences everywhere could understand and relate to. Our goal: to motivate supporters, and attract a new, younger audience to Amnesty. Insight from a major research project guided the design, strategic direction and role of the new website. Our prioritised journeys - those to donate, join and search - were user-tested at design phase and the results fed straight back into development. This reduced waste and ensured that we were able to make a bigger impact of the site’s performance, more quickly. On the new site, every country has its own page which tells a localised story of the state of human rights and the positive impact that Amnesty’s work is having there. A/B testing ensured we launched with the most effective and engaging content, and we continue to test, evaluate and optimise page performance as we learn more about how users interact with the live site. Amnesty.org was designed and built mobile first, so it performs no matter what device is used to access it. And to encourage conversion, we’ve made it extremely easy for users to donate to their chosen country at any point during their time onsite. We exceeded all targets set by Amnesty International around the key journeys to donate, join and search. Amnesty saw a 47% increase in the number of people joining via the website - more people making a bigger difference. "Our tech stack is hosted in Microsoft Azure. This gives us powerful autoscaling. 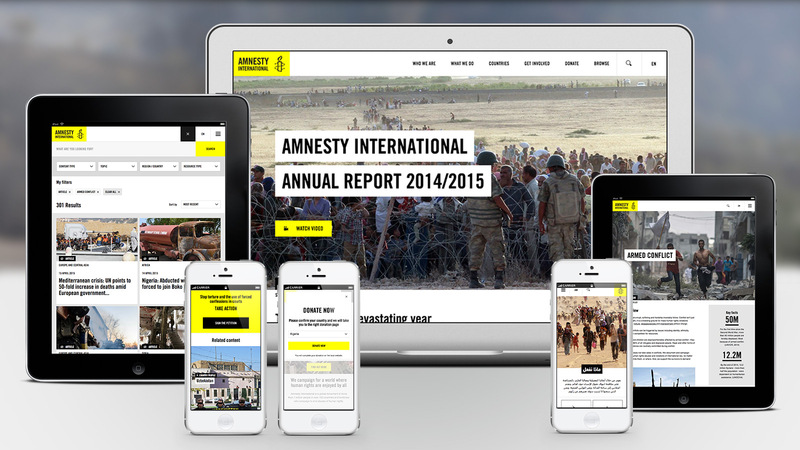 For example, Amnesty recently released their annual report, which led to a 200% increase in traffic to the site. The system scaled with no degradation of user experience. The centralised management also complements a devops mentality."